This is a super easy recipe from my grandmother who made them almost every day for 60 years! My whole family loves them and we have them every gathering. Since Granny passed (at the age of 91) I am the one in the family that makes them. The guests at theInn love them with honey or sausage gravy. They are also really good day old...just split them open, put some butter on and broil. Drizzle some honey over and what a crispy treat! In a large mixing bowl add flour and fork sift. Add butter and shortening and blend with a pastry blender until the mixture looks like crumbs. Then make a well in the center and add the your choice of milk. Stir just until the dough comes together. It will be very sticky at this point. Be sure to push down straight when cutting the biscuits and have a small cup with flour to dust the cutter in between each cut so it does not stick. Place biscuits on a baking sheet just so they touch. If they are really close together they will bake softer and if not touching at all they will be crisper on the outside. We like them crispy in my family and even prefer dark bottoms. Take the scrap dough and form into a ball again and continue making biscuits until all the dough is used. You can even use the last little bit....this is the one we always sample when baked. 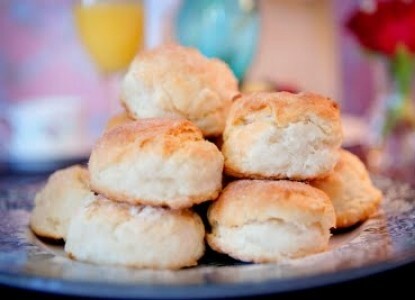 Bake biscuits until light and golden, about 15 minutes. You can butter while hot or leave for later. Serve with honey, butter and jams.